How often have you found yourself passing by a "The Spa" wishing you could receive a relaxing massage but were discouraged to book an appointment due to the lack of convenience, affordability or timing? At Jessica's Massage Spa we guarantee that every visit to our spa will not only work within your schedule but also within your budget! We ensure that your experience at JMS will deliver a soothing and relaxing result that will help design a way to incorporate massage into an important part of your every day life. Our Massage memberships mean convenient availability, less stress, heightened energy, clarity and overall wellness on YOUR schedule! Training isn’t easy. And the harder you work at your sport, the harder it is to recover and perform.Now, at Jessica’s Massage Spa our priority is your performance. 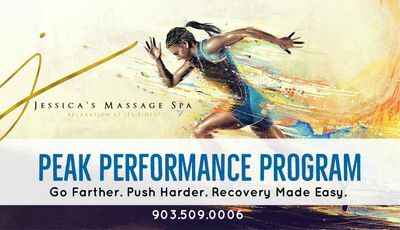 With our Peak Performance program we incorporate multiple modalities that focus on overall recovery and performance for each individual athlete, to keep you at the top of your game now, and prepare you for longevity in your sport. Infrared saunas are an effective tool for natural healing and prevention. Infrared light has the ability to penetrate human tissue which in turn produces a host of anti-aging health benefits, making infrared saunas one of the "hottest" therapies for overall healthier living. If you want to get yourself back into balance, our infrared sauna is the solution to achieving your wellness goals. Come feel the benefits of our full spectrum (near, mid, and far) infrared sauna at our Perspire Inrared Sauna! *see our Perspire Page for more membership options as well as punch cards and individual sessions. With your JMS membership, you get unlimited additional massages or spa services at low membership rates so you're able to live a more stress-free, pain-free, energetic life! Invite friends to experience JMS massages for themselves,­ at a discounted rate of course. Ask your local JMS Spa for "Be Our Guest" passes. These entitle friends to a 1-hour massage session at our introductory rate. Now that's a great plan! Love JMS? Refer us friends! If they become a member within your first month of membership, you'll receive a free one hour massage for every friend that joins, on us. After your first month, you'll receive a $20 credit to spend at the spa for every friend referral to JMS. (same recipient may enjoy one transferred massage every three months by the same member). You have the option to upgrade the length of your massage session at anytime or to add additional enhancements on to your service with member pricing....which mean big savings!!!! Allow your spouse or one family member living in the same household to access membership pricing. Purchase gift certificates or retail at membership pricing.